(From left):AAG Executive Chairman Patrick Jordan, Technical Services Director Mike Byrt, CEO Shane O’Neill and Non-Executive Director Cathal Kilmartin. 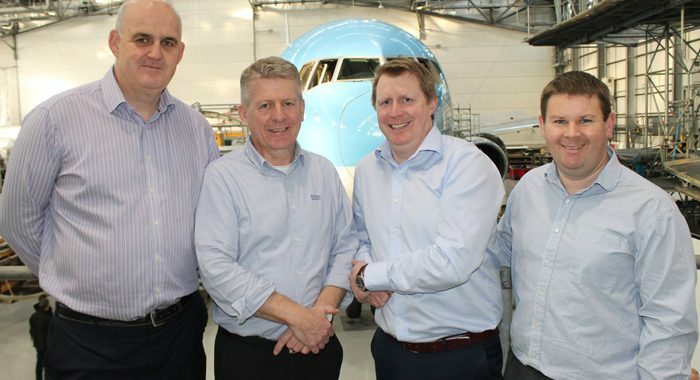 Shannon based Atlantic Aviation Group have this week announced that Mike Byrt has joined the company as the new Technical Services Director. Mr Byrt can be contacted on +353 (0)87 817 3400 or by emailing mbyrt@atlanticaviation.ie. Go to www.atlanticaviation.ie for more. Originally founded in 1962, Atlantic Aviation Group (AAG) Group is one of Europe’s leading independent Aviation service providers, offering maintenance and engineering services to international operators of B737, B757 and B767 type aircrafts. The company employs 220 staff at its Shannon facility, where it has established a strong reputation for quality and technical expertise. In addition to providing comprehensive MRO services, Atlantic Aviation Group supports its customers with a wide range of engineering and technical services and is an EASA approved 147 training organisation, Part 21 Design Services Organisation and a Part M Subpart G and I organisation.